Fast-loading and powerful word processor. Fast-loading, powerful and efficient, Atlantis will be the perfect companion for a wide range of your word processing tasks, - from simple to most complex. A unique typing assist with learning abilities, the Power Type, will help you compose documents in less time. The Overused Words feature will help writers avoid repetitions and cliches. Both the Safeguard and Backup Files features make sure that you work under extremely safe conditions. The Atlantis interface is entirely customizable: toolbars, hot keys, colors and sounds can all be adjusted to suit your own requirements. 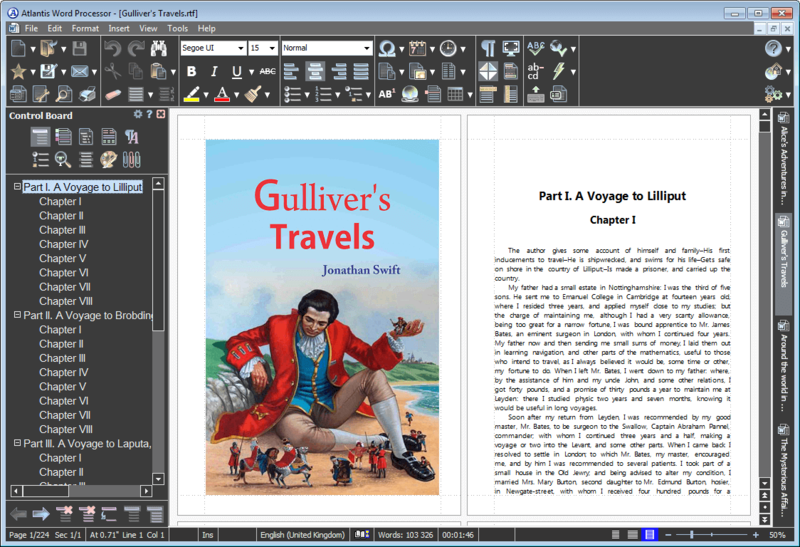 With Atlantis, you can convert any document to an eBook with just a few mouse clicks. And much-much more for you to discover. Version 3.2.4 introduces the Reveal Formatting tool. You can use it to expose and fix formatting mistakes and inconsistencies in your documents, compare formatting of document fragments, and many more.